I don't think it's any great secret that if I didn't vote Plaid I would vote Green. The Green Party launched their manifesto in Brighton yesterday and I don't think anyone who watches the video could fail to notice how many similarities there are between their policies and those of Plaid. Not just on the obvious environmental issues, but on the fundamental principles of a fairer, more equal and more just society. The two are intrinsically linked. What was said by the very impressive Caroline Lucas, as well as Darren Johnson and Adrian Ramsay, was music to my ears. In fact I would go so far as to say that some aspects of their policy are more radical and better than Plaid's ... but we can each judge that for ourselves by glancing through this policy list or reading through the full manifesto, for the sake of cross-fertilization of ideas if nothing else. We in Wales are sometimes prone to look at things only from our own point of view, so this should help remind us that the Wales we want to build is not unusual from a wider global, continental or even island perspective ... just that our version is tailored so that it suits what is unique to our specific circumstances. This is the first time since betting began that a candidate in this contest has been odds-on in this election. Caroline Lucas now has a 51 per cent chance of winning the seat, say [our] customers. The Conservatives are 15-8 (a 35 per cent chance) and Labour third on 9-2 (19 per cent), whilst the Lib Dems are seemingly out of the race at 59-1 (2 per cent). If the Greens do win this and the other two seats, I think there will be plenty of common ground on which we will be able to work and vote together ... as we, and also the SNP, already do in the European Parliament. A point i've made many times. If the Greens did not stand in Wales, and most of their voters went for Plaid (not necessarily all- let's presume a minority of them would be opposed to self-determination), the story of the European Elections would be incredibly different. The usual obstacle I see is that there are 3 principled issues where the Greens would disagree with Plaid- IWJ supporting nuclear power, the bovine TB eradication programme, and Plaid representatives supporting or not being seen to criticise the St. Athan academy. However, by joining Plaid en masse, surely Greens would have sn opportunity to actually improve Plaid's position on things like St. Athan, and on other issues. And in the context of the Euro elections, Jill Evans of course opposed St. Athan anyway. Plaid do not support Nuclear power. The party position is quite clear on that, even if it is not adhered to in Ynys Mon. You are right about the Greens though, although a few of them in Ceredigion are not so pleasant. They have one real flaw. Their bizarre 'England & Wales' mentality. After all, it was largely they who broke up the successful Plaid/Green alliance in Ceredigion, even though it gave them their first MP and a staffer at Westminster. Talk about cutting off your nose to spite your face. They also refused to co-operate in subsequent elections - even recently - mainly, it seems to me, because they refuse to support independence. The separate Scottish Green Party backs it. We must celebrate that, due to their un-Welsh intransigence, Plaid has effectively sidelined them. Serves their right. Being in the Green/EFA group (with Jill Evans its First Vice President), the success of Europe-Ecologie in France (Green/EFA at state level) and the possible formation of a similar coalition in Italy shows the way forward. The pseudo 'Welsh' Greens have been left way behind. Perhaps Plaid's own Greens (me included) can draw comfort from the fact that the second and subsequent UK Green Party MPs will be from England and are unlikely to oppose our freedom, like their MEPs, and are likely to work closely with Plaid MPs. I have to agree witn Anon 21.04. The "Green Party of England and Wales" seems colonialist in its attitude towards Wales. The lack of substance about Welsh issues, including the constitutional question and the ecology of the Welsh language (let alone the use of the language on their site), is striking. A real shame. The Greens in Wales are essentially White Settlers. There are some good policies but I don't want to see Plaid going into formal coalition with them. There are differences, lets just respect that. I have to say, that having personally been involved with some green issues in Swansea, I have found it very difficult to form a meaningful dialogue with any of the Greens I have met. They seem to KNOW EVERYTHING! Though when you ask them questions about the efficiency and load factors actually achieved by Wind Turbines, the ones I have met get very emotional and defensive. Now, as a 100% supporter of WM education .I know that there are a lot of reasonable questions that people have about it. The only way to deal with that sort of quizzing is by being well informed and totally honest, and never to loose your temper. And if there is a question you can't answer off the cuff, rather than dismissing it as irrelevant or stupid, you should admit that it is a good question, and you will give it thought and a bit of research. That hasn't happened with any of the Greens I have encountered at the Environment centre - and I we should be on the same side! - Some of them, incidentally, are nice people who are just not properly equipped. The True Believers! Others -usually the leaders - seem a little bit more sinister. This is probably just a local phenomenon, and I do hope the greens win their second seat, and do well generally, but they should spend far more time educating their followers! 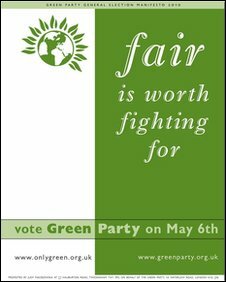 There is nothing whatsoever radical or progressive about the Green Party. I would find it very, very difficult to support a party that had any close relationship with them. Sorry it's taken me a while to get to the comments on this post ... but I'm quite happy for others to get on with the discussion without me. What disappoints me is how comments have been made against the Greens as if they were some sort of people, rather than simply people with particular political ideas. Macsen's comment in particular was obscene. All I would ask people to do is look at the policies themselves rather than be blinded by any preconceived idea of what sort of people Greens are. I am sure that anyone who does that will be struck by how many similarities there are between the Greens and Plaid. And that many of the things that they are proposing for England are precisely what we have done in Wales. Yes, they have an "Englandandwales" blind spot, and I doubt that they realize just how offensive that is to many in Wales. So they too will have to adjust to deal with us in the same way that we need to adjust to deal with them. I don't think the Greens are against independence for Wales. Greens in Scotland certainly want an independent Scotland. I would just highlight one point. In the Euro election last year, 1481 people in Ceredigion (7.76%) voted Green. The recent LibDem surge won't really affect the other three seats Plaid is targetting in this election ... in fact any swing from Labour or the Tories towards the LibDems will actually help us in Aberconwy, Ynys Mon and Llanelli because the LibDems are nowhere in those seats. I believe that persuading Green voters in Ceredigion to vote for Plaid instead of for the bogus Green plans offered by the LibDems yesterday is a very good way of counteracting the advantage the LibDems got as a result of being included in the leader's debates. Ceredigion has now become a tighter contest, and every vote counts.